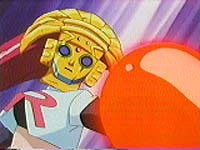 Japanese Episode 196: "Gorubatto VS Kamen no Jou'ou Musashi! (Golbat VS the Masked Queen Musashi! English Episode 439: "Control Freak!" Everyone is having a nice picnic one day when Takeshi's Golbat leads everyone to a ruin where a girl, Natsuki, has collapsed. When she comes to, Natsuki tells the gang that she was in the area to research the ruins where a golden mask and scepter are supposed to rest. The mask and scepter are supposed to have the ability to control pokemon, and an eavesdropping Musashi and Kojirou decide that they have to have it. As Satoshi-tachi tunnel underground with Takeshi's Ishitsubute, Musashi-tachi use one of Nyasu's inventions to reach the chamber first. Musashi puts the mask on and wields the scepter and finds out that they really do have the power to control pokemon. When Satoshi-tachi finally arrive, Musashi is able to control all the pokemon sent to stop her. As the Rocket-Dan make their escape, Takeshi's Golbat and Satoshi's Yorunozuku follow in hot pursuit. The getaway rocket is too quick for the pokemon, but the hard-working Golbat doesn't give up. It evolves into Kurobat, and the pokemon uses its extra set of wings to catch up. After slicing up the Rocket-Dan's rocket, everyone congratulates Takeshi's pokemon as the artifacts are returned. Natsuki takes artifacts as Satoshi-tachi continue on their journey to Asagi City. What's with these long episode titles? For the last two episodes, we've been having these Dragon Ball Z-like episode titles that go around and around in circles. Ah well. Well, after the last good filler episode, we go back to a boring and uninspired filler episode. OK, so Golbat evolves, but it still feels like a really bad filler episode. The thing is, we've already seen this episode during the Kanto League...except that time, it was called "Collision! The Big Pokemon Sculpture" ("The Ancient Puzzle of Pokemonpolis"). Kurobat keeps its Japanese voice. Wow, the music in this episode is even worse than the last episode. I think there were maybe two instances in the dub where the music is kept the same--the rest was replaced or rearranged by 4Kids. This wouldn't bother me too much if 4Kids knew how to score a scene, but they really can't do it the way the Japanese producers can. The frustrating thing is that 4Kids is replacing new-to-the-series music with old Kanto stuff, making the dub lack the musical variety that the Japanese version has. And, as of this writing, none of the Jouto music is available on CD! Come on 4Kids, we wanna hear this music!! Prepare for the worst trouble you've ever seen! With the staff and the mask Jessie's the queen. I'll rule the world with power and might. She'll capture pokemon without a fight. Eh...but...I'll just kneel on one knee! James, her lowly...hey, wait a second! Queen Jessie, ruling all with power and might! You'd better surrender or she'll go on like this all night. Yeah, it's a little repetitive, but so is the Japanese version.